This download includes 37 custom inking presets for the Gloop Pen, Airbrush, Watercolor Brush, Felt Pen, and Ink Pen, ranging from traditional inking styles to smooth manga line art brushes. It also includes a toolbox that lets you access all the presets in a single menu. 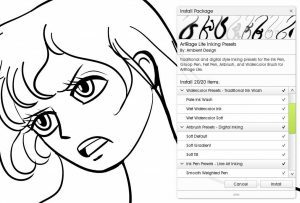 This download includes 20 custom inking presets for ArtRage Lite These are the same as the brushes in the ArtRage 5 Inking Presets download, but with all the incompatible presets removed and no Toolbox. This popular collection of presets was created by forum user screenpainter. 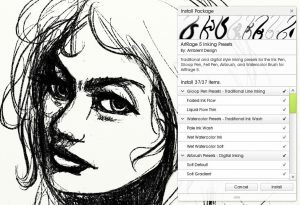 Albert passed away in 2015, but his presets remain one of the most popular and practical collection of inking brushes available for ArtRage. These presets were created using ArtRage 3 Studio Pro and should be compatible with any edition of ArtRage later than ArtRage 2. The tools used at the Felt Pen, Gloop Pen, Ink Pen, Oil Brush, Palette Knife and Watercolor Brush. Learn more about the presets in the forum, or download the package file here. There are presets for many different ArtRage tools in these brush packs. Each of these tools have their own unique properties. They interact with the canvas texture and existing paint in unique ways, and offer different customizable settings, so while some presets may make similar looking strokes it helps to know what the properties of that tool are and which one is best for your needs. The Watercolor Brush, Oil Brush and Felt Pen are traditional wet media tools. This means that they will react to canvas texture and blend with existing paint. 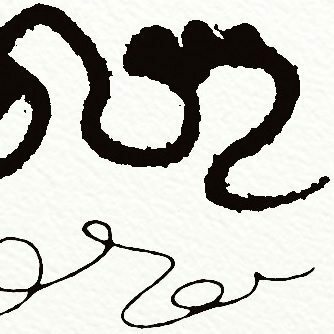 The Gloop Pen will react to canvas texture, but will only blend with ink from the same stroke and will dry as soon as you lift the stylus. The Airbrush and Ink Pen are digital brushes, and do not react to canvas texture or blend. The Palette Knife will blend and scrape paint. It only reacts to canvas texture for some modes and settings, but will always react to paint thickness. A Toolbox lets you collect shortcuts to different tool presets and other resources in a single menu. A package file lets you collect various resources into a single file and then install them automatically into ArtRage. Extract or copy both the .arpack and the .artbx files to your computer. Open ArtRage (Lite, 4, 5, or the ArtRage 5 demo). Go to File > Install Package File and browse to the .arpack file to install the presets. Or doubleclick the package file. Your computer should automatically open ArtRage. Once installed, you can browse to the custom resources folders and copy individual presets for use in other editions of ArtRage (e.g. Android, ArtRage 3 Studio). All presets installed in versions 5.0 onwards (both Lite and the full ArtRage 5), will be available in any other version 5 installation automatically (so you can switch between Lite, the demo, and ArtRage 5, without needing to reinstall any presets). The Toolbox lets you collect all the presets in one menu, instead of having to search through different tools. You can customize the toolbox to add or remove resources and save your own version. After installing the package file, go to View > Toolbox Panel. Open the menu in the Toolbox and choose ‘Load Toolbox’. Browse to the .artbx file to open it. Note: Toolboxes are only supported in ArtRage 4 and 5. The presets in the full brush pack were created in ArtRage 5 and designed to take advantage of ArtRage 5’s features and capabilities. While you can install these presets in ArtRage Lite, and older editions, certain presets may contain unsupported features. You will be able to install and draw with all the presets in this download if you wish (they will not break anything), but some of them may not act as intended. 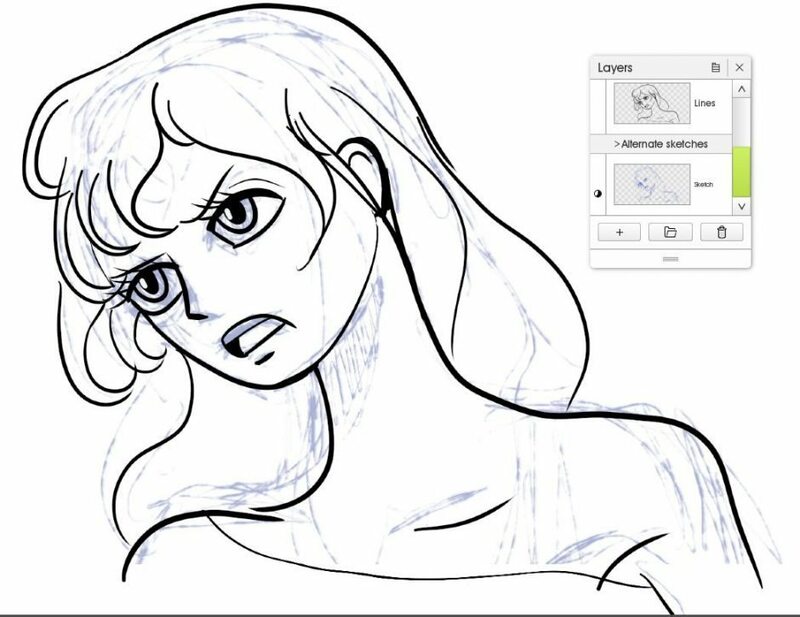 Use the Smooth Weighted Ink Pen preset for line art in both ArtRage Lite and ArtRage 5. If you are using ArtRage Lite, download ArtRage Lite brush pack, which contains only supported presets. If you are using ArtRage 4, you will be able to use almost all presets in the full ArtRage 5 brush pack without problems. These presets are fully compatible with the free ArtRage 5 demo, so if you are not sure a preset is behaving as intended, you can always download the demo and test it there. Custom stylus settings will not work in ArtRage Lite. They will mostly work in ArtRage 4, but not all options are available for all tools. Ink Pen Presets. Many of these will not work properly in ArtRage Lite because it does not support Taper Bias or disabling live stylus tilt. For example, the Ink Pen does not support Live Tilt in ArtRage 4, so the rotation angle is always fixed. ArtRage Lite does support live tilt, but does not allow custom stylus properties, so it cannot be disabled. 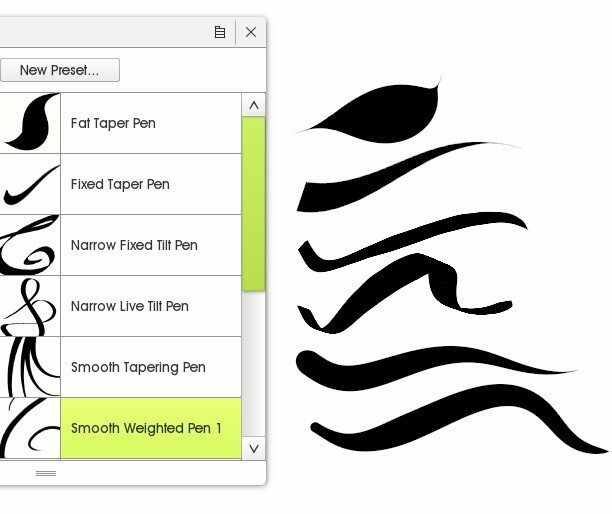 The Airbrush presets also heavily rely on custom stylus properties to use stylus pressure to control size, hardness, and drip spread, so very few of them will work in ArtRage Lite, and the presets will look no different from the default Airbrush. ArtRage Lite fully supports the presets for the Gloop Pen, Watercolor Brush and Felt Pen. They should work exactly the same way as they do in ArtRage 5, with the exception of the ‘Traditional Inking Marker’ Felt Pen Preset, which uses a custom stylus property. Ink Pen: Taper Bias (direction), Square Head.